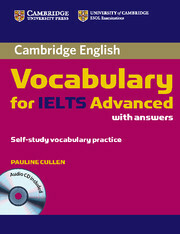 Cambridge Vocabulary for IELTS Advanced focuses on moving students to 6.5 and beyond by working on vocabulary-building strategies necessary for success at advanced levels. It includes useful tips on how to approach IELTS exam tasks and covers especially tricky areas such as paraphrase and collocation. 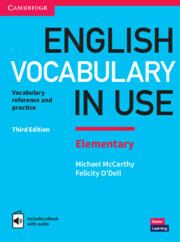 It is informed by the Cambridge English Corpus to ensure that the vocabulary is presented in genuine contexts and includes real learner errors. The Audio CD contains the listening and pronunciation exercises from each unit. The material is suitable for self-study or homework tasks, and may also be used in class with the teacher.